As the wintry mix in Central Ohio went through a constant melt in recent days, Ohio State vowed that it wouldn’t let a midweek loss at Michigan State form into an avalanche. But a hungry Iowa team seeking a signature win delivered a clutch performance down the stretch and left the Buckeyes reeling. Ohio State had only lost back-to-back games twice since the 2008-09 season. Recovering from poor showings has become the norm for a team that’s a yearly contender in the Big Ten championship race. Starting the 2013-14 season 2-2 doesn’t mesh with the Buckeyes’ plans for a sixth regular-season conference title under Thad Matta. The 20th-ranked Hawkeyes overcame a nine-point second-half deficit to beat Ohio State 84-74. They ended the game on a 22-9 run, erasing a 65-62 OSU advantage with five minutes left. After a dismal outing at Michigan State, LaQuinton Ross paced the No. 3 Buckeyes with 22 points, seven rebounds and three assists. But during a crucial sequence late in the second half, Ross went air ball, turnover, turnover on consecutive possessions, earning him a seat on the bench. Amir Williams had 11 points and six rebounds, and Lenzelle Smith Jr. finished with 10 points. Roy Devyn Marble scored a game-high tying 22 points for Iowa, Ohio native Aaron White added 19, Melsahn Besabe recorded 11 points and 10 rebounds, Mike Gesell scored 11 points and Jarrod Uthoff contributed 10 points. It was the Hawkeyes’ first win over Ohio State in eight games and their first in Columbus in a decade. Turnovers plagued the Buckeyes for the second straight game. Uncharacteristic mistakes during crunch time contributed to their 17 turnovers. Iowa scored 27 points off those miscues. The Hawkeyes entered the game owning the No. 8 scoring offense in the country, averaging 86.5 points per game. They were held under that mark Sunday, but an 84-point output against Ohio State’s vaunted defense is one of the most impressive offensive performances of the season. Michigan State’s 72 points, which came in overtime, were the most on the Buckeyes all year. Ohio State trailed 37-35 at halftime after allowing Iowa to score 30 points in the paint. The Hawkeyes added an additional 14 points in the paint during the second half. What was even more detrimental, though, were Iowa’s four three-pointers. Three of those 3s came when the Buckeyes held a nine-point lead midway through the half. They used a 15-3 spurt to grab the lead. It quickly evaporated, with the Hawkeyes scoring nearly 30 points over the game’s final 10 minutes. It outscored OSU 40-21 during the final 12:29. Trailing in the closing minutes, Craft was his pesky self – creating turnovers. 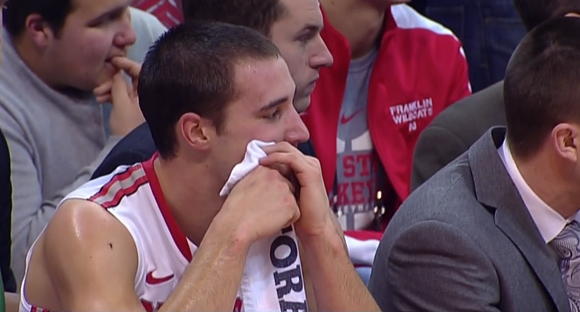 But he missed two of three free throws, which put a damper on Ohio State’s comeback chances. He fouled out with six points, six assists, three steals and six turnovers. The Buckeyes were -19 with Craft on the floor. Ohio State was outrebounded 40-31 and only forced 10 Iowa turnovers. Now the Buckeyes must regroup and try to avoid a third consecutive loss after beginning the season 15-0. A trip to Williams Arena to take on Minnesota isn’t what many would call ideal.